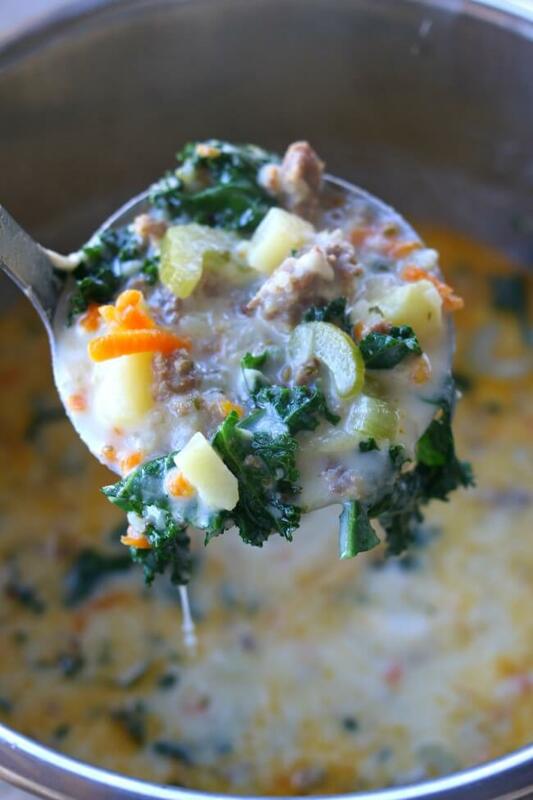 Instant Pot Parmesan Sausage Kale Soup–A creamy and comforting soup that is full of flavor thanks to loads of Parmesan cheese and Italian sausage. Good thing this recipe makes a lot because everyone will be asking for seconds! 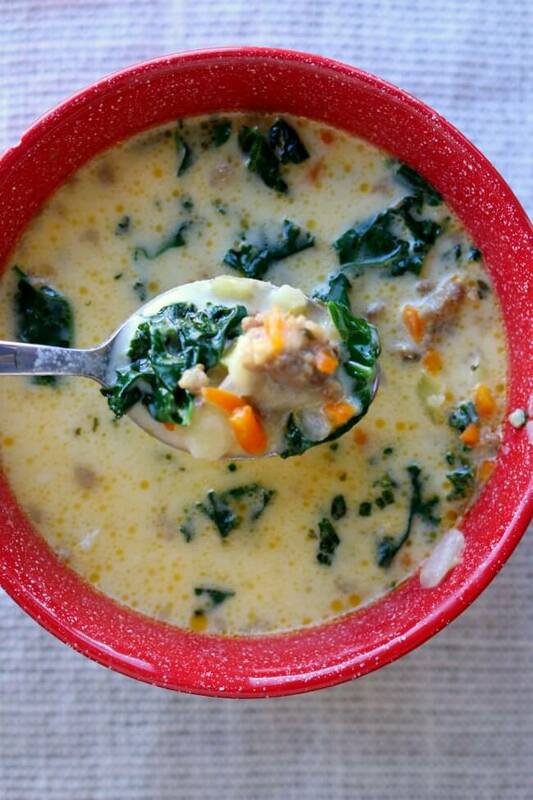 My daughter’s favorite soup is this parmesan, sausage and kale soup. She has been asking for it for ages. 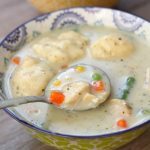 I’ve typically made this soup in the slow cooker but I thought I’d give it a shot in the Instant Pot. I was so excited to tell her when she got home from school yesterday that I had made her favorite meal. She is typically very low energy and unenthusiastic when she gets home from school, she’s a 7th grader after all. But she was instantly excited and energized when she heard the good news. Yay for food! Yay for family! Yay for the Instant Pot! 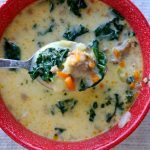 This instant pot parmesan sausage kale soup reminds me of zuppa toscana from Olive Garden but I actually like it better. The reason? It has carrots and celery and more flavor overall. I think you’re really going to like it. We fed ourselves and 2 neighbor kids with this pot and still had leftovers. It makes quite a bit…so yay for lunch leftovers today! Here’s a short video of my favorite part. My favorite part is adding the kale into the soup at the end. I love the fresh bright color it adds and the kale doesn’t taste strong or bitter! I know you’ll love it. To make Instant Pot Parmesan Sausage Kale Soup I used my 6 quart Instant Pot Duo 60 7 in 1. I also own the 6 quart Instant Pot IP-LUX60 V3 Programmable Electric Pressure Cooker. They are both great pressure cookers! The first one I mentioned has a yogurt making function but other than that they are fairly similar. The price difference between the two is about $20. 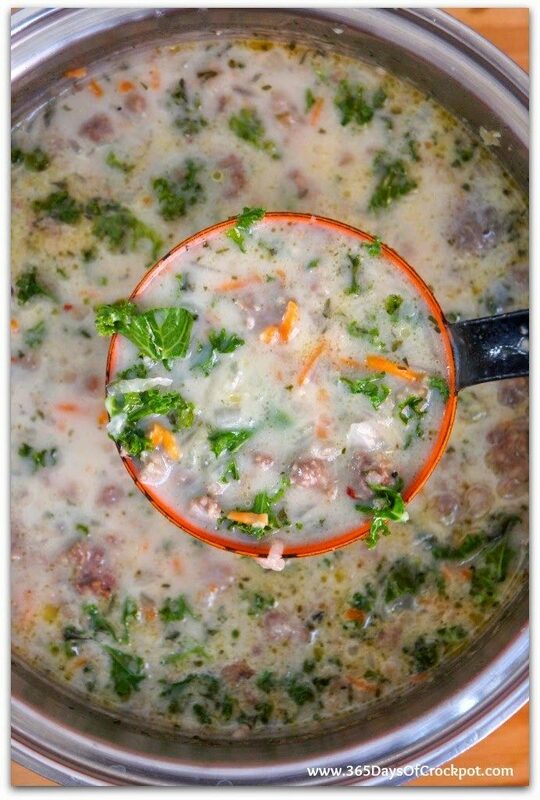 A creamy and comforting soup that is full of flavor thanks to loads of Parmesan cheese and Italian sausage. Good thing this recipe makes a lot because everyone will be asking for seconds! 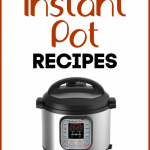 Turn your Instant Pot (IP) on to the saute function. Adjust the temperature to “more” (the hottest saute setting). Brown the ground sausage in the IP for 3-4 minutes. Add in the onion and cook both the sausage and onion for 3-4 more minutes. Drain off excess grease. Stir in water, bouillon, celery, carrots, potatoes, garlic powder, thyme and parsley. Stir in the warmed cream and Parmesan cheese. Lay a piece of kale on a cutting board and then cut off the leaf portion and discard the rib and stem. Cut the leafy portion into bite size pieces. Repeat this step with the other kale leaves. Add kale to the IP and stir. Ladle the soup into bowls and top with extra Parmesan, if desired. You can also make this soup in your slow cooker. Get the slow cooker instructions here. Looks wonderful. But I would like to add beans to it. And all I have are dried ones. I rarely buy canned. How can I incorporate them into the recipe? I would cook the beans beforehand in the instant pot and then rinse them and drain them and add them into the instant pot with the other ingredients when you’re making the soup. Karen. we are doing low carb – could you sub cauliflower for the potatoes and if so – cauliflower rice or florets and how much? Karen…For many reasons I have to sometimes cut out or substitute an ingredient in some of your awesome recipes ….I’m stuck in this one….here you mention chicken bullion …could I use a chicken stock-liquid …and if so how much? Thanks…..I say in all the recipes I print…your rate is 50% to 2% others! Keep up the great work! perhaps change the water to 4cups and the organic chicken stock of one cup?? vs the Bullion? I would remove the water and bouillon and add in 5 cups of broth instead. I have an 8qt IP, DO I HAVE TO MAKE ANY ADJUSTMENTS IN THE RECIPE? Would love to make this, but I live alone and need to freeze things that make more than 4 servings. I don’t think it would freeze well. Hi Karen!!! 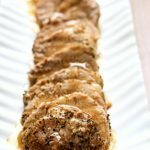 Long time, no see but I’ve now shared this recipe with a bunch of friends because it is so yummy and easy. 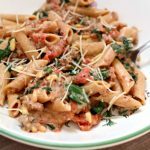 Whenever someone gets a new Instant Pot, I direct them to this recipe first. 🙂 And I make it about every other week for my family. Hope all is well with you. I’d like to try this but I’d like to make it thicker. Any ideas how I should do this? you could make a roux with butter and flour on the stove and stir it in at the end. melts onto the bottom. Any suggestions? I would just add a little bit of cheese at a time and stir or whisk it in thoroughly. I don’t know if there is anyway to totally prevent this from happening. Can you cook the kale with the sausage? I love kale so I would be adding more to the soup but would like to have it cooked. I’m sure you could! Let me know how you like it. Thank you Karen for the recipe! I tried it & it’s really good! Due to carb restrictions I have to leave out the potatoes so I just use the whole bunch of kale. I’ve even used fat free coffee cream in a pinch. This kinda puts me in mind of Zuppa Toscana soup but it’s better!!! Thanks again!! 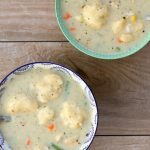 I’m not a fan of cream in my soups, but it seems good enough without the dairy. It’s really good without the cream! I made cashew cream, worked perfectly. This is a delicious soup. 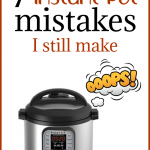 Looks good, you are on a roll with the Instant Pot recipes! Thanks for the shout-out for my split pea soup.